Let us help you rewind the clock! Our skin is often the first impression people have of us. Often more than not, we spend hours trying to cover up imperfections. Acne plagues youth and adults with hormone imbalances and wrinkles… oh, the wrinkles! Wrinkles result from a combination of many factors… sun exposure, smoking and genetics are just a few. Some wrinkling is simply due to the repetitive nature of facial movements and are hard to avoid no matter how healthy we try to live. When you frown or concentrate, the muscles between your brows contract, causing your skin to furrow and fold. And when you squint, the muscles around your eyes contract and cause crow’s feet. As we age, our skin becomes lax, it sags, wrinkles and looses its luster. Sun damage rears its ugly head in the form of brown spots, red spots, spider veins and dryness. What can be done? Skin rejuvenation!! Center For Wellness offers a broad selection of choices to get your skin back in shape. Botox – Medical injection procedure that reduces wrinkles by relaxing strong muscle contractions. Chemical Peels – In office application of prescription strength chemical solutions to the skin that induce exfoliation leaving behind rejuvenated skin. Juvederm – Medical injection procedure that treats deep wrinkles and volume loss through the use of dermal fillers. Kybella – Medical injection procedure that eliminates “double chin” through dissolving neck fat. Microdermabrasion – Non-chemical, non-invasive procedure that uses a spray of microcrystals to remove the outermost layer of dry, dead skin cells and reveal younger, healthier-looking skin. Sclerotherapy – Medical injection procedure to decrease the appearance of varicose and spider veins. Teeth Whitening – Remove years of stains and tarnish and return your teeth to the original pearly whites – or maybe better than the originals! Laser Treatments – Unwanted hair, scars, stretch marks, wrinkles – all can be greatly reduced and/or removed. 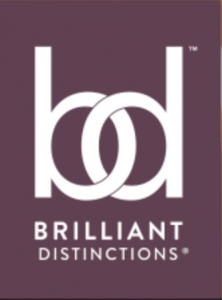 BRILLIANT DISTINCTIONS: CLICK HERE TO FIND OUT HOW TO REWARD YOURSELF! © 2016-2018 | Site Designed By Creative Images, Inc.